If you haven't visited Jerusalem this year and you're planning a trip soon, you may be surprised by the new look of the city. 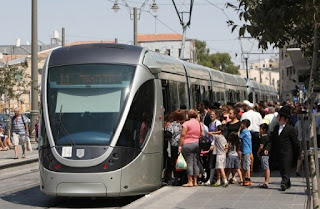 August 19 marked the start of operations of Jerusalem's new light rail system, which runs from Pisgat Ze'ev in the northeast, south along Road 1 (intercity) to Jaffa Road (Rehov Yaffo). From there, it runs along Jaffa Road westward to the Jerusalem Central Bus Station, and continues to the southwest, crossing the Chords Bridge along Herzl Boulevard to the Beit HaKerem neighborhood, finishing just beyond Mount Herzl below Bayit VeGan. The light rail system took a long time to construct and become operational, and there are plans to expand it beyond the 23 stops on what is called Line 1, or the Red Line. "There were a lot of difficulties along the way and we still haven't finished with all of them," said Transportation Ministry Director General Dan Harel, "but I promise that from this point, the improvement curve will be very rapid." Among the remaining matters to be dealt with, in addition to more efficient operation of the traffic signals, are air conditioning issues, electrical and communications problems and the operation of the ticketing system. 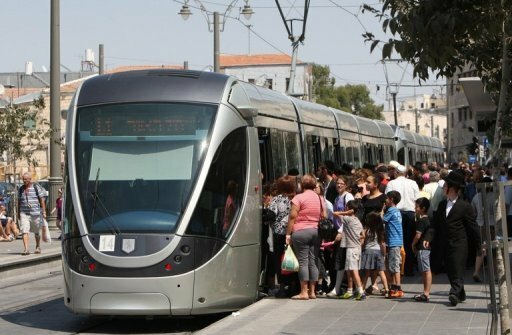 The Jerusalem Municipality therefore announced this week that travel on the system for the first two weeks will be free of charge. Only part of the system will be operational at first, but those involved say the entire system will be up and running within about four months. During that time, the frequency of the trains will increase and travel time will decrease. Once all the traffic lights are installed so that the trains are given the right of way over other traffic, travel over the entire 13.8 kilometer line is due to take 42 minutes from Pisgat Ze'ev at one end to Mount Herzl at the other. The system will operate from 5:30 A.M. to midnight on weekdays. The system will not operate on Shabbat but will resume half an hour after Shabbat ends. During rush hour, trains will arrive at the stations every four minutes. At off-peak times, there will be trains on average every 10 minutes. Join us now for a video tour of the train on its first day of operation. Enjoy!